I received a copy of this book for review. This does not impact the content of my review. I jumped at the chance to read this book. 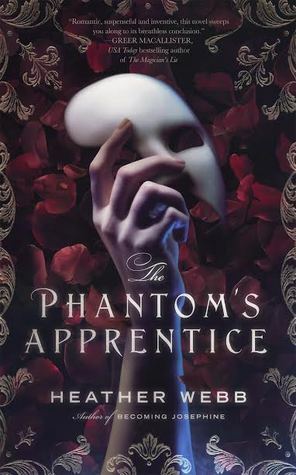 I’ve always adored the music of Andrew Lloyd Webber’s The Phantom of the Opera and the fact that this book takes that rendition of the story and reimagines it with magic and illusionists — count me in. A mix of the classic Phantom story, the musical version we all adore, and the all-new elements of a girl who likes to practice magic tricks equals a thrilling read. The Phantom’s Apprentice was incredibly interesting. It’s both familiar and completely new. Adding the concepts of illusionists – what they do, how they do it, and how they are viewed by society – adds a whole new layer and complexity to the already strange and tangled story of the Phantom. Christine’s fascination with magic, the Phantom’s fascination with Christine, they all have real motivations tied directly to intense emotion from intriguing new backstories. The supporting characters, some creepy and some endearing, also have backstories that add extra understanding to their actions and even more twists and turns to the story. I gripped my Kobo so hard as Christine tried to figure who this Angel/Phantom was, tried to honour both her father’s memory and her mothers, all while navigating well-meaning and not-so-well-meaning redirections from other people connected to the Opera House. In the midst of all of this intrigue, she’s also a teenage girl trying to navigate her own life to figure out what her own future could hold. Hidden passages. Illusions. Attacks. Empathy. Conspiracy. Endearing moments. A romance that actually makes sense. This book has it all. All in all, I like this Christine much more than the Christine in both the original story and the musical. She is fierce. She has her own goals and dreams. She goes against what she thinks her father wanted because she knows she needs to live in the now and not in the past. Oh, and she’s a magician! HEATHER WEBB is the author of historical novels Becoming Josephine and Rodin’s Lover, and the anthology Fall of Poppies, which have been featured in the New York Times, Wall Street Journal, Cosmopolitan, Elle, France Magazine, and more, as well as received national starred reviews. RODIN’S LOVER was a Goodreads Top Pick in 2015. Up and coming, Last Christmas in Paris, an epistolary love story set during WWI will release October 3, 2017, and The Phantom’s Apprentice, a re-imagining of the Gothic classic Phantom of the Opera from Christine Daae’s point of view releasesFebruary 6, 2018. To date, her novels have sold in ten countries. Heather is also a professional freelance editor, foodie, and travel fiend. Visit all the stops on the blog tour! During the Blog Tour Historical Fiction Blog Tours is giving away two paperback copies of The Phantom’s Apprentice! To enter, please enter via the Gleam form below.